Dover, Delaware — Chesapeake Utilities Corporation (NYSE: CPK) (“Chesapeake”) announced today that it has completed the acquisition of the operating assets of Eastern Shore Gas Company (“ESG”) and its affiliate, Eastern Shore Propane Company (“ESP”), which are located in Worcester County, Maryland. Chesapeake’s wholly-owned subsidiaries, Sandpiper Energy, Inc. and Sharpgas, Inc., acquired and will operate the ESG and ESP assets, respectively. The transaction was consummated on May 31, 2013. Management expects the transaction to be earnings accretive in the first full year of operations. The acquisition was financed through unsecured short-term debt. Chesapeake and ESG obtained the necessary approvals and consents to close the transaction, including approval of the Maryland Public Service Commission (“MPSC”), on May 29, 2013. The MPSC approval included implementation of delivery service tariff rates for those customers being served via underground distribution mains. With the implementation of tariff rates, the pricing and other conditions of service are regulated by the MPSC. In the first full year of operations, Chesapeake estimates that Sandpiper Energy will save the community over one million dollars ($1,000,000). Residential and commercial/industrial customers will be charged rates based on the rate schedules approved by the MPSC, regardless of whether they use propane or natural gas. After thirty months from the date of the MPSC’s order, Chesapeake is required to file a formal, in-depth review of its delivery service tariff rates with the MPSC. “In late 2012, Chesapeake’s interstate pipeline subsidiary, Eastern Shore Natural Gas Company (“Eastern Shore”), completed an expansion to bring natural gas to Worcester County, Maryland. The acquisition of the operating assets of ESG by Sandpiper Energy is a key next step in our growth strategy, enabling us to significantly expand our footprint in Worcester County. We are excited about our prospects for natural gas distribution growth in Worcester County and over the next few months, we will evaluate the potential conversion of the ESG facilities from propane to natural gas. We will proceed with conversions where economically feasible,” said Michael P. McMasters, President and Chief Executive Officer of Chesapeake Utilities Corporation. “In addition to providing savings, our objective is to provide superior service to the customers and communities we serve by: increasing their energy options; maintaining our systems and infrastructure in order to provide safe and reliable delivery of energy to customers; and providing the highest levels of customer service,” noted Mr. McMasters. 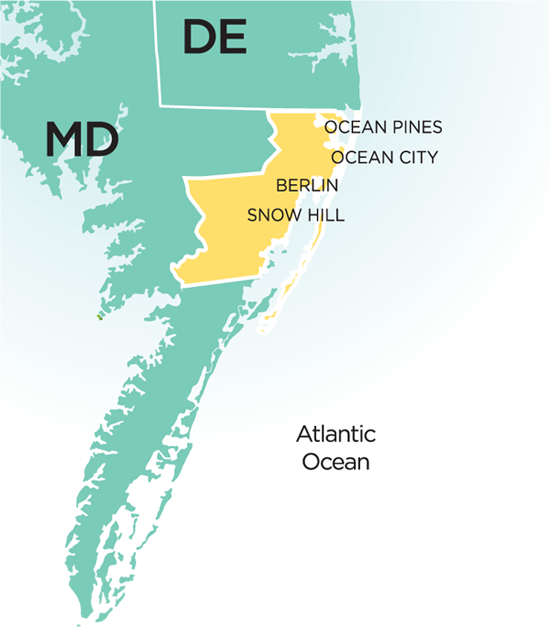 Based in Worcester County, Maryland, ESG provides propane service to approximately 11,000 residential and commercial customers primarily in Ocean City, West Ocean City, Ocean Pines, Berlin, Pocomoke and Snow Hill. The propane distribution service is provided from central storage facilities through underground gas distribution mains and services. ESP provides propane bulk delivery service via individual propane tanks to over 500 customers throughout Worcester County. ESG and ESP are both indirect, wholly-owned subsidiaries of Energy Equity Partners, L.P.
Chesapeake Utilities Corporation is a diversified utility company engaged in natural gas distribution, transmission and marketing; electric distribution; propane gas distribution and wholesale marketing; advanced information services and other related services. With the addition of ESG and ESP customers, Chesapeake, through several divisions and subsidiaries, will provide natural gas and propane distribution service to approximately 103,800 customers on the Delmarva Peninsula. Chesapeake owns and operates a 428-mile interstate pipeline that transports natural gas from various points in Pennsylvania to customers in Delaware, Maryland and Pennsylvania through Eastern Shore, their pipeline transmission subsidiary. Sandpiper Energy, Inc., a new subsidiary of Chesapeake, acquired the operating assets of ESG, and will be providing natural gas distribution service in Worcester County, Maryland. Information about Chesapeake’s businesses is available on the World Wide Web at www.chpk.com. This document includes statements that do not directly or exclusively relate to historical facts. Such statements are “forward-looking statements” within the meaning of Section 27A of the Securities Act of 1933 and Section 21E of the Securities Exchange Act of 1934. These forward-looking statements include statements regarding, benefits of the transaction, including growth expected to arise out of the acquisition, and anticipated future financial operating performance and results, including an expectation that earnings will be accretive in the first full year of operations and thereafter. These statements are based on the current expectations of Chesapeake management. There are a number of risks and uncertainties that could cause actual results to differ materially from the forward-looking statements included in this document. These risks and uncertainties include the following: problems may arise in successfully integrating the operations of ESG and ESP; the conversion of the former ESG facilities from propane to natural gas may not be feasible, economically or otherwise; synergies may take longer than expected to achieve; the transaction may involve unexpected costs or unexpected liabilities; and other economic, business, and/or competitive factors could adversely impact the integration.